Paradigm's new Millenia speaker range brings style to surround sound | What Hi-Fi? The £499/pr MilleniaOne speakers stand just 19.5cm tall, and use a 25mm aluminium-dome tweeter and 15.5cm aluminium-cone mid/bass driver, in a diecast enclosure, also made from aluminium. As well as being very rigid, the enclosures also provide a heatsink for the drive units, and are available in either white or black gloss finishes. The speakers can also be bought as a 5.0 system, with horizontal centre speaker, at £1249, or complete with the MilleniaSub as a 5.1-channel package for £2499. The MilleniaSub itself its 38.25cm tall and just 12.5cm wide, and uses a pair of unique 35.5x7.6cm drive units in a dipole configuration, driven by a 300W amplifier. It comes in satin black or white to match the satellites, again has an all-aluminium enclosure, and can be used on the cradle stand supplied, laid on its side under a sofa, or even wall-mounted with an optional bracket. Other options include Paradigm's Perfect Bass Kit room correction system, and the sub has a built-in wireless receiver for use with the company's add-on PT-2 wireless transmitter. 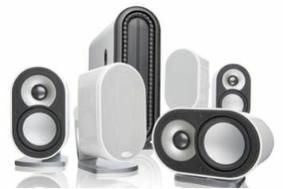 Paradigm speakers are distributed by Anthem AV Solutions.